Forty volunteers – 18 Rotary Club of Banbury members and 22 other volunteer colleagues – have just conducted practice interviews with 225 students from Year 10 at the Warriner School over three days. The scheme requires 14 to 15 year old students to submit their CV and a practice letter of application, for a job or course of instruction ahead of facing a panel of two interviewers during a 30 minute session. From the outset, interviewers focus on gaining the student’s confidence so that they talk as freely as possible about themselves, their interests, experience, skills and ambitions. Being as positive as possible, students are assessed and provided with appropriate feedback (both verbally and in written form) all with a view to improving the future performance of these young individuals under interview conditions. There is a competitive element to being interviewed for a job in real life, and we try to replicate this – at the schools’ request – by identifying a few outstanding candidates and inviting them to come to a second interview. This leads to the selection of a star interviewee who receives a £50 book token prize. 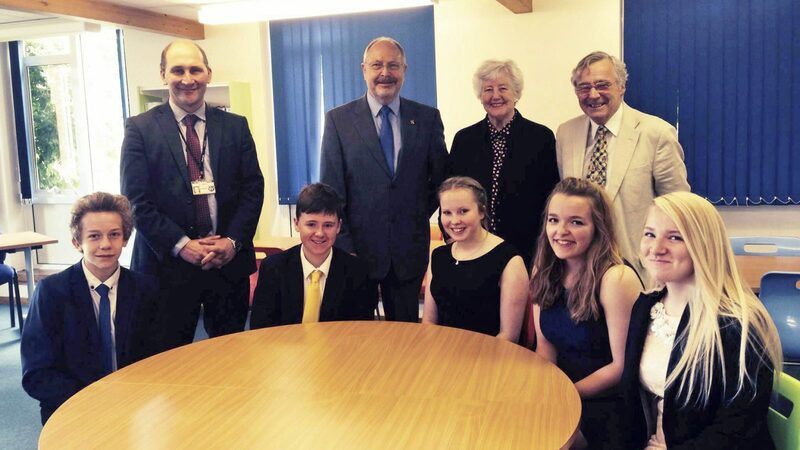 This photo shows five of the six students invited for second interview this year, together with Rotary interviewers and a Warriner teacher. The Practice Interview Programme (PIP) was introduced to the Banbury Club over 10 years ago by the late Rotarian John Meeres, who imported it from his previous Club in Thornaby & Yarm. Blessed George Napier was the first school in Banbury to participate, covering some 140 Year 10 pupils each year. The scheme was later extended to include a similar annual interview for 225 students at The Warriner School in Bloxham. Recent spin-offs include, a regular programme of interviews conducted as part of a Banbury Young Homeless Project mentoring scheme for disadvantaged young people, and individual practice interviews for suitable Frank Wise school 6th form students. We currently have nearly 60 regular volunteer interviewers on our database, all of whom feel that taking part in the PIP process is an enlightening experience, and a good opportunity to observe how the new generations are coping with current educational, social and employment environments.